As freelancers, small businesses, and even job seekers, we share something in common: each of us is the face of our brands. We represent on both a personal and professional level the personality out there engaging with our target customer or client, illustrating our expertise on a particular subject matter and building visibility around the work that we do. One of the biggest challenges brands and business of all maturity levels face, whether your organization is comprised solely of you, or of a team of 100, is building and maintaining a solid brand presence in a saturated, digitally-driven market. New brands have the hurdle of figuring out how to announce their arrival and stand out among a sea of competition, while existing brands face a similar challenge in positioning themselves in the market as they grow and evolve. It’s important to identify which platforms and networks speak to a need for small business brands to build visibility and maintain a positive reputation. A story around your brand, from the reason for its inception, how you became an expert in your field, or why your products or services have positively impacted the lives of your customers, creates a sense of relevance and trust in the eyes of your customers, and gives them a way to connect and engage with your brand. With all the information that’s available out there through a basic Google search, people want to cut through the clutter and the noise to quickly determine who’s going to provide what they need for the best quality and price point. For this type of information, they turn to their peers and colleagues for informed opinions and recommendations. The bigger and more consistent your presence is on the appropriate channels, the likelier you are to the around by prospective customers who are searching for relevant products and services. However, it’s no longer enough to throw up a website or a LinkedIn company page, register a Twitter handle and share some relevant content once in awhile, or stock up an Etsy shop and let their search algorithm handle the rest. Building an effective digital brand presence is about understanding who your core audience is and where they “hang out” online, and this happens outside of just social media. Consistency is essential to your online brand, from your profile photo or logo, to your content. Professional profiles function as your digital resume, your online business card, and are the first things people will often see about you. Make them polished and enlist tools that will create an excellent first impression. Be consistent in your headlines and your descriptions. What you say in the body of your profiles should support the high-level ideas presented in your headlines. If you describe yourself as an “Innovative Designer & Visual Problem Solver,” explain what that means in terms of what you’ve done or the services you provide. Avoid heavy claims that simply sound good on paper unless you’re prepared to back them up with evidence and examples. 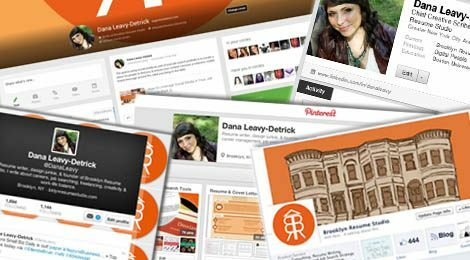 There are a number of services out there like Klout or Brand Yourself to help you measure the effectiveness and reach of your digital brand presence, and manage your reputation. Of course, there is also information that you can’t control, and it’s important to monitor what is being published with yours or your company name attached. Conduct a thorough Google search and set up Google alerts to be notified of any mentions you may not be aware of. Avoid falling into the trap of creating a one-off profile on a network and never tending to it again. Make it a point to be continually connecting with thought leaders, potential partners or collaborators, and individuals who make up your target customer market. Participate in conversations, get involved in networking groups, and share interesting content and ideas of your own that illustrate your expertise and credibility. This is the quickest way to start positioning yourself as knowledgeable and in-touch with what’s going on in your field, and customers are looking for evidence of that. A solid online brand presence should be built around a universal message that answers the question, “What do I want potential employers/clients to know about me as a professional in my field?” Whether you’re actively job searching, changing careers, building your freelance client base, or simply looking to build and maintain your network, cultivating a presence on the appropriate online platforms will help you to increase your visibility while managing your professional reputation. Click here to learn more about The Digital Brand Presence package for small businesses.